More than 2,700 public sector workers in Turkey have been sacked for alleged links to terror groups as the government presses ahead with purges launched following last year's failed military coup. According to two government decrees published in the Official Gazette on Sunday, those dismissed in the new wave of purges include 637 military personnel, 360 gendarmerie force members and 150 academics or other university workers. At least 115 people who were previously dismissed were reinstated to public sector jobs. The government also closed down two local newspapers, 14 associations and one health clinic, according to the Gazette. Turkey blames the July 2016 coup attempt on US-based cleric Fethullah Gulen and has branded his network of followers a terror organisation. 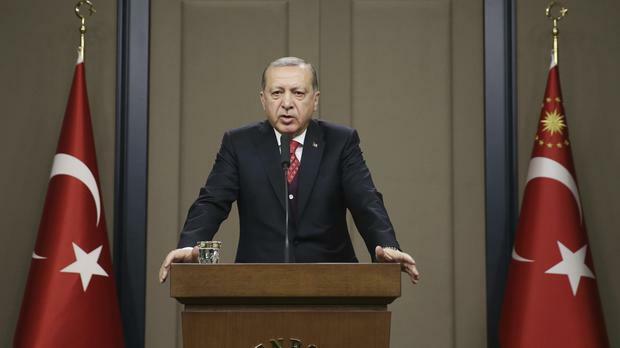 Turkey declared a state of emergency after the coup that has enabled the government to arrest some 50,000 people and dismiss more than 110,000 civil servants for alleged links to Mr Gulen or militant groups in a crackdown since then. The government says the purges and arrests are needed to counter the continuing danger posed by followers of Mr Gulen's movement. Critics say the government is using its emergency powers to jail opponents and silence dissent. Mr Gulen has denied accusations that he masterminded the coup. According to Sunday's decrees, defendants who are on trial on terrorism charges will from now on appear in court wearing "almond and grey-colored uniforms". The decision comes months after a defendant accused of links to the coup wore a T-shirt with the word "hero" emblazoned on it, sparking a public outcry. Turkish President Recep Tayyip Erdogan vowed to ensure that Gulen supporters wore uniforms similar to those worn by prisoners at Guantanamo Bay when appearing in court. On Sunday, Mr Erdogan told reporters the uniforms would be worn by male defendants. Justice ministry officials would also work out a dress code for female defendants.